And I'm not talking about the candy or the floatation devise. This little cup came to the rescue today. It saved me from doing more laundry. It saved the van from another cleaning. It saved Kade from embarrassment and humiliation. Can you see where I'm going with this? This morning we looked at five houses. (Not one was a winner.) As we started pulling away from the last house Kade starts to panic, saying he really has to go potty. What are we supposed to do? There's nothing available but trees. If it were our house I would have let him. But we're in someone else's neighborhood and it's raining. He couldn't hold it. You could clearly see that on his face. I asked if there were any cups in the van. The girls looked and said no. Kade then remembered that he shoved one in the back of the seat yesterday. I climbed in the back to help hold the "toilet" while he relieved himself. That totally grossed the girls out. Meg climbed into the way back away from all the action. Both girls either looked away or covered their eyes saying what big sisters say. Meanwhile, Mickey and I are trying not to crack up. I did empty the cup on the side of the road. He almost filled it! The rain will wash it away. Then we couldn't help ourselves. We were laughing and laughing. This was a good way to end another frustrating day of house hunting. 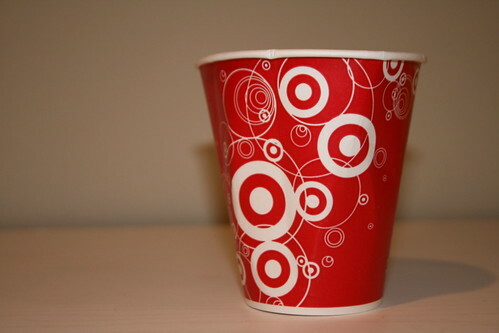 did you wash this cup before photographing it?? LOL. Thats a great story! We had a similar experience coming home from Indy once. Sorry to hear you are not finding the home of your dreams though. Any takers on yours? Hang in there, finding the house and the paperwork are the hardest things, I think. The paper cup saves the day! That's awesome. I'm sure it was even funnier in person. Umm...I didn't wash it out. Is that gross? Becca, you must be behind in your reading. We sold the house on March 20th. Am I the only parent who keeps a carry out cup with lid in the car for just this purpose?